The Rocky Monster Show performed by pupils of Chantry and Newminster Middle Schools in Morpeth. Monster mayhem took over Morpeth schools as almost 200 pupils staged their own rock ‘n’ roll musical. The Rocky Monster Show was played to packed audiences over two days earlier this month by youngsters from Newminster and Chantry middle schools. The bizarre musical combined a riotous mix of The Addams Family, Young Frankenstein, Phantom of the Opera, Rebecca and The Rocky Horror Show as an ex-pop star turned genetics professor brought to life the ultimate rock group, headed by a clone of Elvis. And the audience and youngsters enjoyed the rock ‘n’ roll score in equal measure as an affectionate send-up of the 1960s. Executive Headteacher of the Three Rivers Trust Simon Taylor said: “This was a wonderful show, full of fun, great tunes and fabulous dancing. 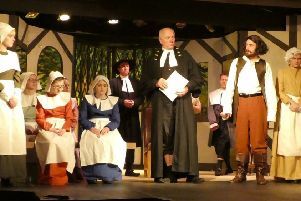 The whole show was brought together by the pupils, with the set made by Bronze Arts Award students, tickets and programmes designed in the schools, props made by the Lego club and a sound and lighting crew providing the special effects. And, of course, there was the singing, dancing and acting. Students from the acting degree course at Newcastle College provided coaching, while a sixth form pupil at Morpeth’s King Edward VI School (KEVI) choreographed and taught the dances. In addition, KEVI staff and students helped with the sound and lighting, and staff from the schools were involved with tuition and support roles. Year 6 pupil Kate Leja said: “It was superb. We were resilient in making the show the best it could be, always striving to be better. Others delighted in their starring roles.